Eric Thames actually washed out of baseball in the United States shortly after his time with Seattle. Eric Thames’ time with the Mariners was neither significant nor memorable. Many fans might not remember that Thames was even with the organization or know that Thames is the hottest hitter in Major League Baseball and one of the more interesting stories early in the 2017 season. 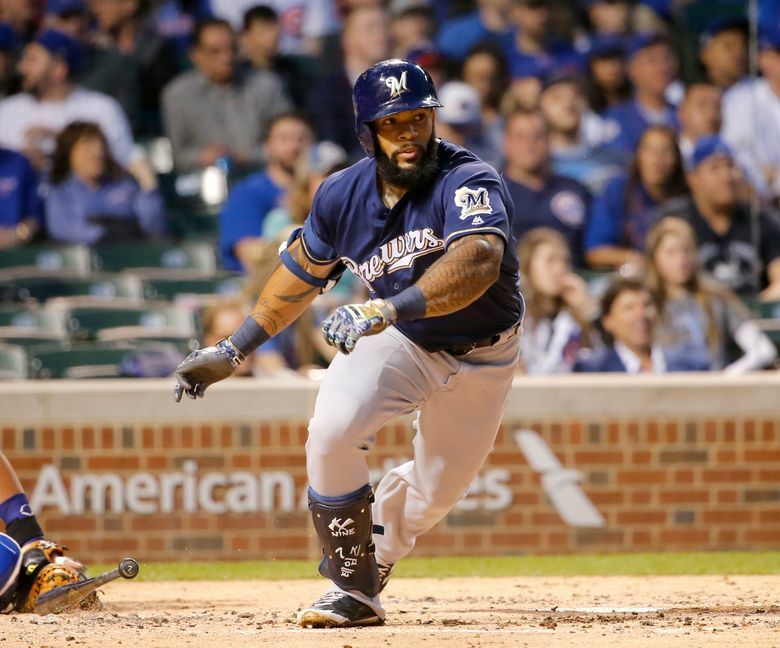 Coming into Saturday, Thames was hitting .379 with a .463 on-base percentage, a ridiculous .897 slugging percentage, six doubles, an MLB-leading eight homers and 14 runs batted in for the Brewers. This isn’t a case of “they always get better after they leave the Mariners.” Thames didn’t get better immediately after leaving the Mariners. He actually washed out of baseball in the United States shortly after his time with Seattle. Back in 2012, with Seattle slogging its way to a 77-85 record, then-general manager Jack Zduriencik, in a very Zduriencik move, made a trade-deadline deal, acquiring Thames from the Blue Jays for reliever Steve Delabar on July 30. It was notable at the time because the Mariners were playing the Blue Jays at Safeco Field and Delabar just had to switch clubhouses. Thames, who was at Class AAA Las Vegas at the time, was an outfielder who couldn’t play outfield but did have plenty of power-hitting potential. The Mariners put him on the 25-man roster and gave him a chance to get consistent big-league at-bats. Only three current Mariners players were on that team — Felix Hernandez, Hisashi Iwakuma and Kyle Seager. Asked about how Thames could swing properly being that muscular? “Violence, pure violence,” Seager said. Beyond the muscular appearance, which made him look like an NFL strong safety, Thames was friendly, outgoing and naturally curious about things outside of baseball, which left him always reading at his locker when he wasn’t working out. He was quick to have conversations about a myriad of topics and had books stacked in his locker next to his myriad of protein powders and supplements. Thames played in 40 games with the Mariners that season as Seattle rolled out a lineup with a bunch of young players hoping to gain traction for the future. He hit .220 (27 for 123) with a .695 on-base percentage, five doubles, two triples, six homers, 14 RBI and 47 strikeouts in 40 games. He also provided verification that he was a total liability in the outfield at the time, something that manager Eric Wedge and his staff wouldn’t forget. To his credit, Thames did make a solid running catch in the first inning to preserve Hernandez’s perfect game on Aug. 12 of that season. Thames wasn’t expected to and didn’t make the 25-man roster coming out of spring training in 2013, particularly after the club brought back Raul Ibanez on a one-year contract and signed Jason Bay. Thames was later designated for assignment in June of that season when Franklin Gutierrez was coming off the 60-day disabled list. The Mariners then traded him to Baltimore for minor-league infielder Ty Kelly. Thames was sent immediately to Class AAA Norfolk and instead of getting a call-up late in the season, he was designated for assignment by the Orioles on Sept. 1. He was claimed by Houston and played for Class AAA Oklahoma City in the Pacific Coast League playoffs. That offseason, Thames asked for his release so he could sign with the NC Dinos of the Korean Baseball Organization and make some legitimate money. It was in Korea where earned the nickname “God” for his prodigious power and production and that imposing physique seemed to get bigger with each season. In his first season, Thames hit .343 with a 1.111 OPS, 30 doubles, six triples, 37 homers and 121 RBI. His next season: .381 batting average, 1.288 OPS, 42 doubles, five triples, 47 homers, 140 RBI and 40 stolen bases in 142 games. In a triumph of his growing plate discipline and adjusting to the offspeed pitch first, second and always mentality of the KBO, he drew 103 walks and struck out just 91 times. Last season, he hit .321 with a 1.106 OPS, 30 doubles, three triples, 40 homers and 121 RBI. The Brewers signed him to a three-year, $16 million contract to play first base and replace Chris Carter. It was a gamble that many teams wouldn’t take given the lower level of play in the KBO. But Milwaukee general manager David Stearns, who was with the Astros when they claimed Thames off waivers in 2013, had been monitoring him from afar the past few seasons. “He became a little more contact-conscious,” Stearns told the Milwaukee Journal Sentinel. “He has a slightly flatter path through the (hitting) zone than he did previously in the United States. He went from a guy who had a shallower path through the zone, perhaps was trying to hit home runs, to someone who kept his bat in the zone longer. The result of that was harder contact and organically hitting for more power. Obviously, Thames can’t continue to hit at this type of pace going forward. But he’s found his way back to the big leagues as a better player.